Robotic start-up companies range from the whimsical to the amazing, from futuristic to topical, and from hubs of robotic activity in Silicon Valley, Boston, New York City (a new hub) and Switzerland to far-off places around the world: Turkey, Tel Aviv, Moscow, Christchurch, Reykjavik, Singapore, Shenzhen, Buenos Aires — essentially, everywhere that programmers program and engineers tinker. This article first appeared on pages 191-198 in “World Robotics Service Robots 2013” published by the IFR (International Federation of Robotics) Statistical Department. Copies of that book and its companion “World Industrial Robotics 2013” both of which can be purchased here. It is reprinted with permission from the publisher. Ekso Bionics’ exoskeleton, Xenex Healthcare Services’ room disinfection robot, VGo’s VGo, Giraff Technologies’ Giraff. Photos from manufacturers websites. In healthcare, Ekso Bionics (a spin-off from UC Berkeley and 6-year old Berkeley Bionics) and their exoskeleton are beginning to penetrate rehabilitation therapy centers while a 2008 start-up, Xenex Healthcare Services’ room disinfection robot is helping to disinfect ICU’s and hospital surgeries everywhere. In remote-presence healthcare, 6-year old VGo Communications and their VGo mobile robots have begun to focus on outpatient and remote-presence communications especially for pediatric care, while 2009 American transplant to Sweden Giraff Technologies is shipping their mobile robots as nursing home assistants. 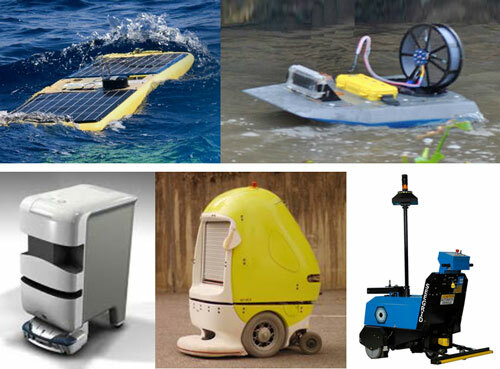 Liquid Robotics Wave Glider, Platypus’ raft, tugs by Aethon, RobCab AB and Seegrid.Photos from manufacturers websites. In underwater exploration, Liquid Robotics, a 2005 start-up focused on recording whale songs has transitioned into their very popular and successful multi-purpose wave gliders used in oil platform monitoring, for naval security, and tracking hazardous materials, while CMU 2012 spin-off Platypus LLC autonomous airboats are being evaluated by public and private agencies for river and reservoir water analysis. In materials handling, as companies begin again to invest in upgrading their material handling hardware and systems after the economic crisis, Aethon (a 2005 VC funded project) and their hospital tugs, 2010-Swedish start-up RobCab AB and their multi-purpose tugs, and 2003-founded Seegrid and their warehouse trucks and tugs are all benefiting. 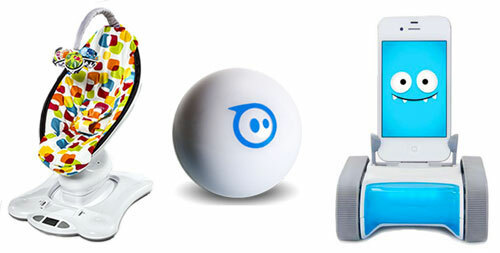 4moms Mamaroo robotic baby rocker, Que Innovations Sphero and Romotive’s Romo. Photos from manufacturers websites. In consumer products, toys and gadgets, 4moms (an 8-year old start-up) and their line of baby devices is a huge success story, particularly their robotic baby rocker named Mamaroo, while Sphero, the robot ball, by 2011 Canadian start-up Que Innovations, is just beginning, and 2009 start-up Romotive‘s $149 Romo is selling thousands of their cute little iPhone-carrying devices. In artificial intelligence, 2010 start-up Universal Robotics and their Neocortex spatial vision software are now selling sensor-based machine learning devices for automated pick and place, high-end 3D inspection and de-palleting operations while 2012 Willow Garage spin-off Industrial Perception‘s similar 3D vision-guided technology is in trials for truck loading and unloading applications. Both have made serious AI inroads into random 3D spatial loading and unloading methodology. In agriculture, 2012 Stanford VC start-up Blue River Technologies and their lettuce thinning system, 2009 Spanish start-up Agrobot and their strawberry picking robot, 2012 start-up Autonomous Tractor and their cab-less farm tractor, and 2009 French start-up Wall-Ye and their vineyard robot are all VC funded, in testing mode and look quite promising while 2009 start-up Harvest Automation recently finished their beta testing and have begun to sell their speedy little plant-moving robots. In unmanned aerial systems, to mention just a few of the many start-ups, CyPhy Works and their unique tethered infrastructure inspection UAS, Canadian Precision Hawk (previously Winehawk Labs) and their survey UAVs and Swiss SenseFly (recently acquired by Parrot) and theirs surveying and 3D mapping are all showing future apps likely to penetrate the commercial marketplace for UAS. For small niche robotic markets, CandyCam and their event camera systems, and QBotix and their solar panel positioning robots are both doing well. Stealth companies like Redwood Robotics may be building a competing product to Rethink Robotics’ Baxter robot. TerrAvion may be working on an aerial system for agriculture and Vishwa Robotics is working on a wide range of classified projects. Momentum Machines’ hamburger maker, Zen Robotics’ trash sorter, Puzzlebox’s mind-controlled quadcopter. Photos from manufacturers websites. And in the way-out-there category, Momentum Machines and their hamburger maker, Foldimate and their laundry folding system, Zen Robotics and their trash sorting system, Puzzlebox Productions‘ mind-controlled quadcopter, TechJect‘s miniature flapping Dragonfly UAS and Anki, the new Apple app/toy combo. Robotic projects often get funded for strange reasons. Many are at the whim (in scientific circles they call it “inspiration”) of researchers attempting to conquer an interesting scientific challenge. This often translates into commercial projects just to get the funding to continue to do research. Many crowd-funded projects fit into this latter category. Others are funded to solve specific as-yet-undiscovered methods of doing something that needs to be done. The space and defense programs (NASA and DARPA) are perfect examples of the latter and are referred to as “strategic funding” and there’s a whole industry of technology transfer to make their inventions into commercial ventures. TechJect’s Dragonfly and FormLabs’ 3D printer. Photos from manufacturers websites. In the last few years, the influence of crowd-funding is shaking things up and can be seen in some of the start-ups cited above. Kickstarter, Indiegogo and Angel List have all had their robotic hits – some even raising millions. TechJect‘s Dragonfly is an example. The spin-off from GA Tech raised over $1 million on Indiegogo! 3D printer start-ups also did quite well and FormLabs‘ Kickstarter campaign was a record-breaking $2,945,000 from 2,068 backers (FormLabs was only seeking $100,000)! Crowd funding may be a passing fad, but for the last couple of years these types of sites have provided start-ups with a quick sense of whether their idea will sell to the public or not — and they don’t require giving away equity. Crowd funded projects also pop up on the radar of venture capitalists searching for interesting new ventures. There is no doubt that slick marketing and performance videos do well in that environment. Also, equity crowd funding is coming; the Securities and Exchange Commission is working on the rules. Crowd funding supporters believe the process helps entrepreneurs become profitable while rewarding investors; others are concerned about online fraud and bad investments stimulated by lively videos focused toward inexperienced investors. Nevertheless, crowd funding is here to stay and will soon include equity as a perk of investing. Further, it is spreading globally. Although robot start-ups and other long-lead projects don’t get as much attention as some of the other projects, the number of robotics-related crowd funded projects is up and the sophistication of the presentations is also up – both a boon to getting the attention of serious equity investors (VC’s and hedge funds). Finally, a review of the makeup and geography of 235 start-up companies can be seen in the chart below. Robotic start-up companies are privately held robotic companies established to develop a concept or product or robotic-related service for sale but don’t yet have it all together. 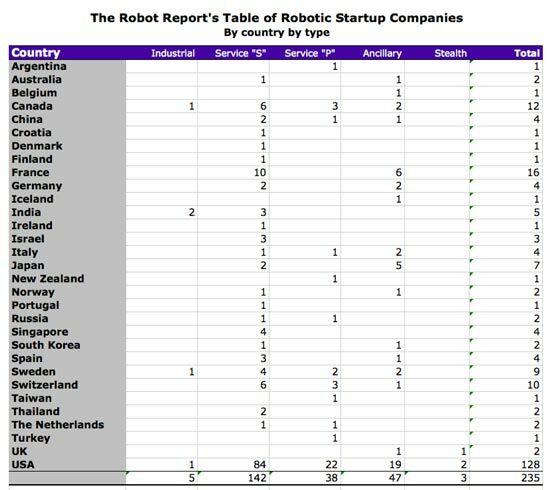 From the chart below one can see that few are attempting to become industrial robotic manufacturers; instead, most are offering service robotic solutions for industry, home use, health care and academia. Stealth = indicates robotics-related but specifics unknown because companies don’t yet have a web or social presence or are in a language that is difficult to search and translate.